Hosting.cl Review 2019: Is Hosting.cl a Good Hosting? 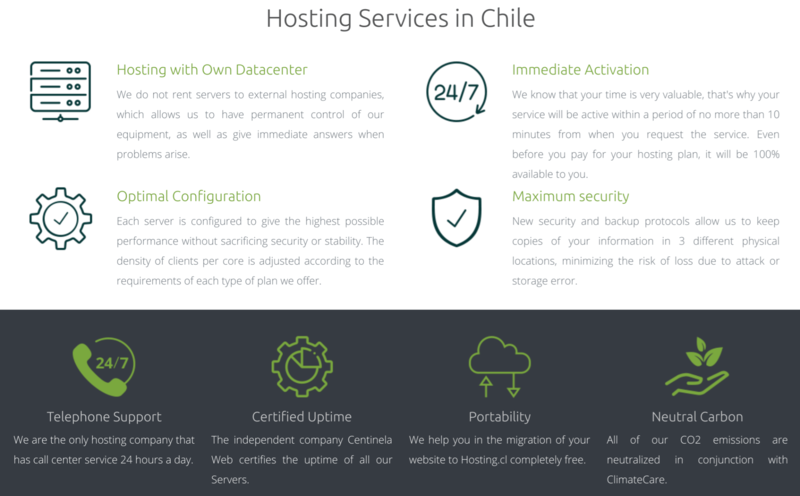 Hosting.cl is a Chilean host with its own data center. If you can get by without a website building tool or the latest version of PHP, its plans include a good level of features and run on enterprise-level hardware. Hosting.cl is a Chilean website hosting provider which has been providing services since 1999. It has more than 20,000 customers, including some large brands such as Telefonica. Although this vendor’s website is only in Spanish, you can also be supported in English. Hosting.cl owns its own Chilean data center, which means you should expect fast response times to issues and less chance of resources being oversold. According to its website, it is the only hosting company in Chile to be ISO 97001 certified and to have a carbon neutral footprint. Some (but not all) of the hosting plans run on SSD, but be sure to check which ones if this is important to you. As well as of offering a 99.7% annual uptime guarantee, Hosting.cl uses the CentinelaWeb third-party tool to measure and advertise its uptime over the previous 12 months. This is very transparent and shows that the actual uptime had been between 99.70% and 99.85% in the 12 months leading up to when I looked. The hosting plans support PHP (but only the slower version 5), phpMyAdmin, MySQL databases, and remote MySQL connections. You also get Cron jobs and SSH access. Beginners will be pleased to see the Softaculous installer for more than 300 programs, but it was confirmed to me by live chat that there is no website building tool. Hosting.cl’s plans do have a premium price point, but you get what you pay for. This provider owns its own data center, and you’re allowed unlimited domains and data transfer with all plans. Just be sure to check the inclusions because similar-priced plans do not necessarily have identical features. You can purchase the plans on one-month or one-year terms, with a 20% discount for committing to a year. If you dig deep enough, you can also find a 30-day money-back guarantee hidden away in the fine print. One very minor issue is that the live chat disconnects if you move off the web page during the conversation. If you prefer not to seek one-on-one support, you will find a plethora of help pages that include FAQs, video tutorials, and help documents. This fast-growing Chilean hosting company added more than 2,405 new hosting services in the previous 12 months and recently relocated due to its continued expansion. Its shared hosting plans don’t come with a website building tool, and they only support PHP version 5, but they do run on SSDs and have a 99.7% uptime guarantee plus substantial resource allocations and features. Wondering how Hosting.cl stacks up against other Web Hosting companies? Enter any other Web Hosting company and we will give you a side-by-side comparison.